As someone who reads a lot of manga every month, it is easy for me to get a little jaded. I do enjoy the commercial manga that comes out from mainstream publishers, but it is nice to experiment a bit and try something different now and then. Working Kentauros is exactly the type of title I was hoping for when Jmanga launched. I was hoping that the online format would result in some quirky titles being translated, and my wishes were fulfilled to some degree when Jmanga translated a manga that I’d heard about but never hoped to read, Ekiben Hitoritabi. Working Kentauros is about the work lives of centaurs who have entered modern society and it is without a doubt one of the most surprising and well-executed manga that I’ve read recently. I knew I was in for a treat when I saw that the first page featured a businessman in full gallop, clutching a briefcase and stuffing a carrot in his mouth. The next page features a diagram of the contents of a Kentaur’s briefcase, starting with his company cellphone and ending up with a protective charm against traffic accidents. There was more humor and charm packed into the first couple pages of illustrations of Working Kentauros than I see in many full chapters of manga. So, centaur businessmen is a great gimmick for a manga story, but part of what makes this book so great is the way Est Em integrated what might seem like a goofy concept into her manga. Kentaurs have much longer lifespans than humans, and anti-discrimination laws have only recently been passed that allow them to work in human office environments. The first few chapters deal with the daily life of Kentaro, a Kentaur who has recently been hired by a harness making company. He has to run up flights of stairs to get to work, arriving at the office so sweaty that his senpai has to groom him before they go to a business meeting. Kentaro’s senpai has a certain amount of grudging respect for him. Even when he yells in disbelief “How dare you carry a cordovan leather briefcase!” he says that Kentaro is a good worker. Then he straps boxes to Kentaro to help in an office move, leaving Kentaro to wonder if he’s experiencing workplace bullying. When Kentaro finally is able to ride the larger elevator at his new office building, he finds himself the target of an anonymous molester. 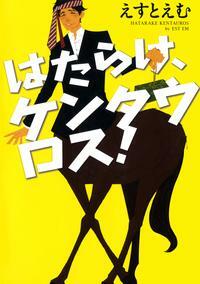 Kentaro’s senpai helps him track down the pervert, and it ends up being a horse-crazy lady he has a crush on! Throughout the next few chapters Kentaro and his senpai get to know each other better, and Est Em slips in interesting details about Kentaur society. They add on names based on their work with humans over the years and since they are so long lived, the oldest Kentaurs have names that are so long it is difficult to introduce themselves in one breath. While Kentaro seems like a man who has just graduated college, he’s around fifty years old. Est Em’s art has simple but mobile line work, and she’s great at portraying Kentaro’s thrilled excitement about an elevator he can fit in as well as his habits of galloping off on sales calls. The character designs are attractive and in proportion, which ends up highlighting some of the difficulties the Kentaurs face when they are navigating through a world that wasn’t originally designed for people with half-horse bodies. The second half of this series focuses on Kentaurs with dreams of other jobs like opening up a noodle stand or becoming a messenger. There’s a chapter that focuses on a successful male model Kentaur who is only able to get work with a stand-in serving as his Photoshopped human legs. As goofy as the concept of Working Kentauros might seem, it is very clear that Est Em has spent plenty of time thinking about her characters and their relationships with each other. There’s a great page towards the end of the book that shows the difference in lifespans of the characters for a Kentaur and human who have gone into business together as partners in a shoe company. A quick succession of images shows the human aging while the Kentaur stays the same age, working at his job the entire time. Working Kentaurous blends plenty of whimsy and humor with the more serious topic of showing people who are just trying to make their way in the world even though they might have hooves instead of feet. This book was carefully designed too, and sadly one thing that gets lost in the transformation from print to digital are the tiny Kentaur animated flipbook illustrations that are placed at the bottom of each page. This was the first manga by Est Em that I’ve read, but it definitely won’t be the last. If you’re a Jamanga subscriber already, reading this book is a no-brainer. If you haven’t signed up for the site yet, this is a great first title to try. Access to electronic copy provided by Jmanga.